O'Neill began researching high-energy particle physics at Princeton in 1954, after he received his doctorate from Cornell University. Two years later, he published his theory for a particle storage ring. This invention allowed particle accelerators at much higher energies than had previously been possible. In 1965 at Stanford University, he performed the first colliding beam physics experiment. While teaching physics at Princeton, O'Neill became interested in the possibility that humans could survive and live in outer space. He researched and proposed a futuristic idea for human settlement in space, the O'Neill cylinder, in "The Colonization of Space", his first paper on the subject. He held a conference on space manufacturing at Princeton in 1975. Many who became post-Apollo-era space activists attended. O'Neill built his first mass driver prototype with professor Henry Kolm in 1976. He considered mass drivers critical for extracting the mineral resources of the Moon and asteroids. His award-winning book The High Frontier: Human Colonies in Space inspired a generation of space exploration advocates. He died of leukemia in 1992. After he was honorably discharged in 1946, O'Neill studied physics and mathematics at Swarthmore College. As a child he had discussed the possibilities of humans in space with his parents, and in college he enjoyed working on rocket equations. However, he did not see space science as an option for a career path in physics, choosing instead to pursue high-energy physics. He graduated with Phi Beta Kappa honors in 1950. O'Neill performed his graduate studies at Cornell University with the help of an Atomic Energy Commission fellowship, and was awarded a Ph.D. in physics in 1954. After graduating from Cornell, O'Neill accepted a position as an instructor at Princeton University. There he started his research into high-energy particle physics. In 1956, his second year of teaching, he published a two-page article that theorized that the particles produced by a particle accelerator could be stored for a few seconds in a storage ring. The stored particles could then be directed to collide with another particle beam. This would increase the energy of the particle collision over the previous method, which directed the beam at a fixed target. His ideas were not immediately accepted by the physics community. He explored the possibilities of flying gliders inside a space colony, finding that the enormous volume could support atmospheric thermals. He calculated that humanity could expand on this man-made frontier to 20,000 times its population. The initial colonies would be built at the Earth-Moon L4 and L5 Lagrange points. L4 and L5 are stable points in the Solar System where a spacecraft can maintain its position without expending energy. The paper was well received, but many who would begin work on the project had already been introduced to his ideas before it was even published. The paper received a few critical responses. Some questioned the practicality of lifting tens of thousands of people into orbit and his estimates for the production output of initial colonies. Although NASA was supporting his work with grants of up to $500,000 per year, O'Neill became frustrated by the bureaucracy and politics inherent in government-funded research. He thought that small privately funded groups could develop space technology faster than government agencies. In 1977, O'Neill and his wife Tasha founded the Space Studies Institute, a non-profit organization, at Princeton University. SSI received initial funding of almost $100,000 from private donors, and in early 1978 began to support basic research into technologies needed for space manufacturing and settlement. In 1977, O'Neill saw the peak of interest in space colonization, along with the publication of his first book, The High Frontier. He and his wife were flying between meetings, interviews, and hearings. On October 9, the CBS program 60 Minutes ran a segment about space colonies. Later they aired responses from the viewers, which included one from Senator William Proxmire, chairman of the Senate Subcommittee responsible for NASA's budget. His response was, "it's the best argument yet for chopping NASA's funding to the bone .... I say not a penny for this nutty fantasy". He successfully eliminated spending on space colonization research from the budget. 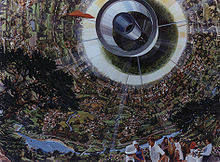 In 1978, Paul Werbos wrote for the L-5 newsletter, "no one expects Congress to commit us to O'Neill's concept of large-scale space habitats; people in NASA are almost paranoid about the public relations aspects of the idea". When it became clear that a government-funded colonization effort was politically impossible, popular support for O'Neill's ideas started to evaporate. Other pressures on O'Neill's colonization plan were the high cost of access to Earth orbit and the declining cost of energy. Building solar power stations in space was economically attractive when energy prices spiked during the 1979 oil crisis. When prices dropped in the early 1980s, funding for space solar power research dried up. His plan had also been based on NASA's estimates for the flight rate and launch cost of the Space Shuttle, numbers that turned out to have been wildly optimistic. His 1977 book quoted a Space Shuttle launch cost of $10 million, but in 1981 the subsidized price given to commercial customers started at $38 million. A 1985 accounting of the full cost of a launch in 1985 raised this as high as $180 million per flight, and later estimates as the Space Shuttle program neared its end in 2011 were much higher yet. On November 18, 1991, O'Neill filed a patent application for a vactrain system. He called the company he wanted to form VSE International, for velocity, silence, and efficiency. However, the concept itself he called Magnetic Flight. The vehicles, instead of running on a pair of tracks, would be elevated using electromagnetic force by a single track within a tube (permanent magnets in the track, with variable magnets on the vehicle), and propelled by electromagnetic forces through tunnels. He estimated the trains could reach speeds of up to 2,500 mph (4,000 km/h) — about five times faster than a jet airliner — if the air was evacuated from the tunnels. To obtain such speeds, the vehicle would accelerate for the first half of the trip, and then decelerate for the second half of the trip. The acceleration was planned to be a maximum of about one-half of the force of gravity. O'Neill planned to build a network of stations connected by these tunnels, but he died two years before his first patent on it was granted. O'Neill was diagnosed with leukemia in 1985. He died on April 27, 1992, from complications of the disease at the Sequoia Hospital in Redwood City, California. He was survived by his wife Tasha, his ex-wife Sylvia, and his four children. A sample of his incinerated remains was buried in space. The vial containing his ashes was attached to a Pegasus XL rocket and launched into Earth orbit on April 21, 1997. It re-entered the atmosphere in May 2002. O'Neill directed his Space Studies Institute to continue their efforts "until people are living and working in space". After his death, management of SSI was passed to his son Roger and colleague Freeman Dyson. SSI continued to hold conferences every other year to bring together scientists studying space colonization until 2001, then irregularly thereafter. All three of the founders of the Space Frontier Foundation, an organization dedicated to opening the space frontier to human settlement, were supporters of O'Neill's ideas and had worked with him in various capacities at the Space Studies Institute. One of them, Rick Tumlinson, describes three men as models for space advocacy: Wernher von Braun, Gerard K. O'Neill, and Carl Sagan. Von Braun pushed for "projects that ordinary people can be proud of but not participate in". Sagan wanted to explore the universe from a distance. O'Neill, with his grand scheme for settlement of the Solar System, emphasized moving ordinary people off the Earth "en masse". In fiction, the protagonist of Stephen Baxter's Manifold: Time names his spaceship the Gerard K. O'Neill. As of November, 2013, Gerard O'Neill's papers and work are now located in the archives at the Smithsonian National Air and Space Museum, Steven F. Udvar-Hazy Center. O'Neill, Gerard K. (1977). The High Frontier: Human Colonies in Space. New York: William Morrow & Company. ISBN 0-9622379-0-6. Cheng, David C.; O'Neill, Gerard K. (1979). Elementary Particle Physics: An Introduction. Reading, Massachusetts: Addison-Wesley. ISBN 0-201-05463-9. O'Neill, Gerard K. (1981). 2081: A Hopeful View of the Human Future. New York: Simon and Schuster. ISBN 0-671-44751-3. O'Neill, Gerard K. (1983). The Technology Edge: Opportunities for America in world competition. New York: Simon and Schuster. ISBN 0-671-44766-1. O'Neill, Gerard K. (1954). "Time-of-Flight Measurements on the Inelastic Scattering of 14.8-Mev Neutrons". Physical Review. 95 (5): 1235–1245. Bibcode:1954PhRv...95.1235O. doi:10.1103/PhysRev.95.1235. O'Neill, Gerard K. (April 1956). "Storage-Ring Synchrotron: Device for High-Energy Physics Research". Physical Review. 102 (5): 1418. Bibcode:1956PhRv..102.1418O. doi:10.1103/PhysRev.102.1418. O'Neill, Gerard K. (August 1963). "Storage Rings". Science. 141 (3582): 679–686. Bibcode:1963Sci...141..679O. doi:10.1126/science.141.3582.679. PMID 17752920. O'Neill, Gerard K. (May 1968). "A High-Resolution Orbiting Telescope: New techniques would lead to orbiting an optical telescope 25 times the diameter of Palomar's". Science. 160 (3830): 843–847. Bibcode:1968Sci...160..843O. doi:10.1126/science.160.3830.843. PMID 17774392. O'Neill, Gerard K. (September 1974). "The Colonization of Space". Physics Today. 27 (9): 32–40. Bibcode:1974PhT....27i..32O. doi:10.1063/1.3128863. O'Neill, Gerard K. (Fall 1975). "The High Frontier". CoEvolution Quarterly (7): 6–9. Retrieved August 18, 2008. O'Neill, Gerard K. (December 5, 1975). 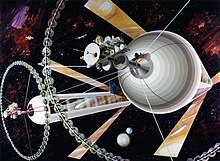 "Space Colonies and Energy Supply to the Earth". Science. 190 (4218): 943–947. Bibcode:1975Sci...190..943O. doi:10.1126/science.190.4218.943. O'Neill, Gerard K. (October 1976). "Engineering a Space Manufacturing Center". Astronautics and Aeronautics. 14: 20–28, 36. Bibcode:1976AsAer..14...20P. O'Neill, Gerard K. (March 1978). "The Low (Profile) Road to Space Manufacturing". 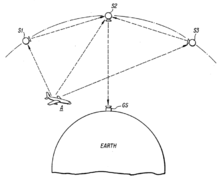 Astronautics and Aeronautics. 16 (3): 18–32. Bibcode:1978AsAer..16...18G. O'Neill, Gerard K.; Driggers, Gerald; O'Leary, Brian (October 1980). "New Routes to Manufacturing in Space". Astronautics and Aeronautics. 18 (10): 46–51. Bibcode:1980AsAer..18...46G. O'Neill, Gerard K.; Kolm, Henry H. (November 1980). "High acceleration mass drivers". Acta Astronautica. 7 (11): 1229–1238. Bibcode:1980AcAau...7.1229O. doi:10.1016/0094-5765(80)90002-8. O'Neill, Gerard K. (1981). "Where is everybody? Some new answers". Nature. 294 (25): 25. Bibcode:1981Natur.294...25O. doi:10.1038/294025a0. O'Neill, Gerard K. (March 1981). "Satellite Air Traffic Control". Astronautics and Aeronautics. 19 (3): 27–31. O'Neill, Gerard K. (1981). "Recent developments in mass drivers". Space manufacturing. 4: 97–104. OCLC 8112602. O'Neill, Gerard K. (July 1982). "Satellites Instead". AOPA Pilot. 25 (1): 51–54, 59–63. O'Neill, Gerard K. (September 1983). "Geostar". AOPA Pilot. 26 (9): 53–57. O'Neill, Gerard K.; Maryniak, G. E. (1988). "Radiation Shielding to Solar Power Satellites: Results of the January 1988 SSI/Princeton Lunar Systems Study". Lunar Bases. 2: 185. Bibcode:1988LPICo.652..185O. ^ a b O'Neill, G. (1956). "Storage-Ring Synchrotron: Device for High-Energy Physics Research" (PDF). Physical Review. 102 (5): 1418–1419. Bibcode:1956PhRv..102.1418O. doi:10.1103/PhysRev.102.1418. Archived from the original (PDF) on March 6, 2012. ^ "Patent US5433155: High speed transport system". Google Patents. Google. Retrieved June 1, 2017. Brand, Stewart (1977). "Interviewing Gerard O'Neill". Space Colonies: A CoEvolution Book. Whole Earth Catalog. ISBN 0-14-004805-7. Is the surface of a planet really the right place for an expanding technological civilization? Hoddeson, Lillian (1997). "The Rise of Colliding Beams". The Rise of the Standard Model. Cambridge University Press. ISBN 0-521-57816-7. Kolm, Henry H.; Snow, William R. (1992). "Electromagnetic Launch of Lunar Material" (PDF). Space Resources. 2. Washington DC: United States Government Printing Office. pp. 117–135. ISBN 0-16-038062-6. NASA SP-509. Martin, Donald H. (2000). "North American Satellites". Communication Satellites. El Segundo CA: American Institute of Aeronautics and Astronautics. ISBN 1-884989-09-8. Weintraub, Pamela (1984). "Cosmic Colonies" (PDF). The OMNI Interviews. New York: Ticknor & Fields. pp. 296–314. ISBN 0-89919-215-7. "Gerard K. O'Neill". Notable Scientists: From 1900 to the Present. Gale. January 1, 2001. "Gerard K(itchen) O'Neill". Contemporary Authors Online. Gale. August 22, 2003. United States National Commission on Space (May 1986). Pioneering the Space Frontier. New York: Bantam Books. ISBN 0-553-34314-9. Retrieved April 17, 2009. Bateman, Selby (August 1984). "Interview: Gerard K. O'Neill". Compute! (51): 42. Retrieved August 7, 2008. Daniels, Lee A. (April 29, 1992). "Gerard K. O'Neill, Professor, 69; Led Studies on Physics and Space". The New York Times. Davis, Don (March 2006). "Space Settlement: The Call of the High Frontier". Ad Astra. Washington DC: National Space Society. Retrieved August 28, 2008. Dickson, Ellsworth (October 2007). "Magplane Technology developing unique mineral transportation system" (PDF). Resource World Magazine: 80–81. Archived from the original (PDF) on December 18, 2008. Retrieved 2008-10-27. Brandt-Erichsen, David (November – December 1994). "The L5 Society". Ad Astra. Washington DC: National Space Society. Retrieved August 24, 2008. Ferris, Timothy (May 3, 1981). "Nonfiction in Brief". The New York Times. Grierson, Bruce (April 2004). "Beyond NASA: Dawn of the Next Space Age". Popular Science. New York. Retrieved September 4, 2008. Henson, H. Keith; Henson, Carolyn (March 1977). "An Interview with Gerard K. O'Neill" (PDF). L-5 News. 2 (3): 8–10. Retrieved August 23, 2008. Honan, Patrick (May 25, 1990). "LAWN: For a Simple, Wireless LAN". Personal Computing. 14 (5): 174. Lovell, Robert (November 1977). "Letters to L-5" (PDF). L-5 News. 2 (11): 1. Retrieved August 26, 2008. Meinel, Carolyn (July 2007). "For Love of a Gun". IEEE Spectrum. 44 (7): 40–46. doi:10.1109/MSPEC.2007.376607. Archived from the original on December 27, 2008. Retrieved December 3, 2008. O'Neill, Gerard K. (September 1977). "O'Neill Summer Study Notes" (PDF). L-5 News. 2 (9): 9. Retrieved August 26, 2008. Overend, William (July 11, 1977). "Colonizing Outer Space for Earthlings". Los Angeles Times. p. F1. Proxmire, William (March 1978). "Letters to L-5" (PDF). L-5 News. 3 (3): 5. Retrieved August 28, 2008. Rein, Richard K. (December 12, 1977). "Maybe We Are Alone—Physicist Gerry O'Neill Says that's a Reason for Sending People into the Safety of Space". People Magazine. 8 (24). Retrieved August 17, 2008. Ridpath, Ian (June 23, 1977). "Living out there". New Scientist. Retrieved December 6, 2010. Sexton, Tara (June 26, 1989). "PC Expo Spotlights Local Area Network Efficiency, Networking DOS". PC Week. 6 (25): 41–42. Simons, Marlise (April 22, 1997). "A Final Turn-on Lifts Timothy Leary Off". The New York Times. Retrieved September 3, 2008. Sullivan, Walter (May 13, 1974). "Proposal for Human Colonies in Space Is Hailed by Scientists as Feasible Now". The New York Times. p. 1. Retrieved August 22, 2008. "Morris K. Udall Gives Support to O'Neill" (PDF). L-5 News. 1 (1): 1. September 1975. Retrieved August 24, 2008. Weil, Henry (April 29, 1984). "In Short: The Technology Edge". The New York Times. Retrieved October 4, 2008. Werbos, Paul J. (December 1978). "Congress Views Space" (PDF). L-5 News. 3 (12): 15–17. Retrieved August 28, 2008. "Sylvia Turlington Wed at Her Home". The New York Times. June 18, 1950. p. 73. Retrieved August 23, 2008. "O'Neill, Dr. Roger A.". San Francisco Chronicle. May 23, 2008. p. Z-99. "Comsat, Motorola score coup; purchase Geostar Corp. assets". Satellite News. December 9, 1991. Archived from the original on March 29, 2015. Retrieved December 3, 2008. Hanushek, Eric (March 27, 1985). "Testimony on Space Shuttle Pricing Policy" (PDF). United States Senate, Washington DC. Retrieved August 28, 2008. Hoyt, David (December 14, 2006). "X PRIZE Foundation: Revolution Through Competition" (PDF). Stanford Graduate School of Business. Archived from the original (PDF) on November 19, 2008. Retrieved 2008-10-19. Richter, Burton (October 2, 2002). "SLAC and Accelerators: SLAC 40th Anniversary Celebration". Stanford University. Archived from the original on April 24, 2009. Retrieved 2008-12-07. "Rick N. Tumlinson Biographical Information". Personal Website. March 1, 2006. Archived from the original on April 22, 2012. Retrieved 2008-08-07. "Space Studies Institute History". Space Studies Institute. 2008. Archived from the original on January 13, 2008. Retrieved August 27, 2008. "About Space Studies Institute". Space Studies Institute. 2008. Archived from the original on January 13, 2008. Retrieved August 27, 2008. "Phi Beta Kappa Award in Science Winners". Phi Beta Kappa Society. 2007. Archived from the original on January 24, 2006. Retrieved November 26, 2008. "Geostar Corporation Records 1983–1991". National Air and Space Museum, Smithsonian Institution. 2006. Retrieved August 30, 2008. "Press Release" (PDF) (Press release). Keystone Semiconductor. September 13, 2006. Archived from the original (PDF) on December 18, 2008. Retrieved September 2, 2008. "Pegasus HAPS (Hydrazine Auxiliary Propulsion Subsystem) Rocket Body Reentry Prediction". Center for Orbital and Reentry Debris Studies. The Aerospace Corporation. May 20, 2002. Archived from the original on June 23, 2008. Retrieved August 7, 2008. "Magneplane Technology Incorporated Principals". Magneplane Technology Group. Archived from the original on June 28, 2008. Retrieved 2008-10-27. "National Space Society Gerard K. O'Neill Memorial Award". National Space Society. June 11, 2008. Retrieved September 5, 2008. Dismukes, Kim (December 1, 2008). "Career Astronaut Biographies: Former Astronauts". National Aeronautics and Space Administration/Lyndon B. Johnson Space Center. Retrieved December 3, 2008. "Quarterly Launch Report" (PDF). Federal Aviation Administration Office of Commercial Space Transportation. July 25, 1997. Retrieved December 3, 2008. McCray, W. Patrick. The Visioneers: How a Group of Elite Scientists Pursued Space Colonies, Nanotechnologies, and a Limitless Future (Princeton University Press; 2012) 328 pages; Focuses on O'Neill and the MIT-trained engineer Eric Drexler in a study of exploratory science.